LEGO Lord of the Rings - приключенческая аркада, разработанная студией Traveller's Tales. Игра основана на Властелине Колец - серии фэнтезийных книг за авторством Джона Рональда Руэла Толкиена. В LEGO Lord of the Rings, игроки возьмут на себя роль Фродо и его верных друзей, которые должны пройти через нелёгкие испытания, посетив известные по книгам и кинофильмам локации, чтобы уничтожить Кольцо Всевластия. Charming and delightful, faithful to the source yet cheekily irreverent, and packed with features that feed into each other in satisfying ways, The Lord of the Rings marks yet another highpoint in the Lego series. Lego The Lord of the Rings is perhaps the finest treasure that the partnership has yet produced, a compelling mixture of cooperative gameplay, secrets galore, and a story that remains one of the most fantastic that Hollywood has ever captured on film. Traveller's Tales has crafted a wonderful platformer that stands on its own – though the Lego charm and a great license make it even better. A handful of technical stumbles can't keep Lego Lord of the Rings from being the best Lego game so far. Finding a great compromise between the linear installments and the sprawling open world of Lego Batman 2, Traveller's tales hits sweet spots in the structure and gameplay, constantly giving players new goals and new places to explore. Despite the missing original German voice actors and a somewhat confusing menu LEGO The Lord of the Rings strikes with humour, level diversity and the original soundtrack. Particularly, the co-op mode caters for hours of fun for players of every age. За Traveller's Tales можно только порадоваться: ребята не перестают делать по-настоящему добрые и интересные игры, которые понравятся и тем, кто знаком с оригинальными вселенными, и тем, кто нет. Things like the lack of online co-op are undoubtedly more prevalent with each iteration, but Lego Lord of the Rings is still a huge success that's wonderfully adorable and an absolute delight to play. Despite a few bugs with the checkpoint system (we experienced a crash in the ending cutscene of a level and had to repeat the entire thing, for instance), Lego: Lord Of The Rings is an entirely pleasant experience, especially if you haven't seen Peter Jackson's films recently, or simply don't mind sitting through an abbreviated version of them again. It's easy to feel a little jaded about yet another LEGO game, especially coming so soon after LEGO Batman 2: DC Super Heroes. But that soon fades as you jump into LEGO The Lord of the Rings. This huge, open-world game simply never misses a beat and also breathes new life into the familiar property of The Lord of the Rings. A light-hearted take on heavy-duty subject matter is no more than what we've come to expect from Travellers' Tales. In adding RPG features without shattering the returning mechanics, however, the LEGO team have arguably outdone themselves. You shall not pass this one up. Покупая игру TT Games вы получаете гарантированно качественный и знакомый продукт, при этом дополненный и доработанный. Уникальность этих игр в том, что для получения удовольствия необязательно любить LEGO или быть знакомым с исходным материалом - достаточно отложить в сторону серьезность, взять геймпад (с клавиатурой серия по-прежнему не дружит), нажать на Start и отправиться громить лего-кирпичики и собирать лего-монетки. A wonderful experience for gamers of all ages, and a sure-fire Christmas present hit for fans of the film trilogy. 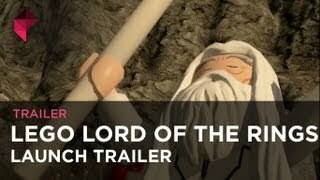 LEGO: The Lord of the Rings – одна из лучших игр серии Lego, предлагающая последовательную сюжетную линию с продуманным кооперативом, множеством разнообразных элементов и прекрасным юмором. Несмотря на то, что груз прошлых частей все же дает о себе знать, совместное прохождение сгладит многочисленные недостатки и позволит в полной мере насладиться игровым процессом. Игра также отлично подходит для семейного отдыха и совместной игры с детьми, а это для многих родителей-геймеров просто бесценно. The LEGO series reach new heights with this LOTR game. Open World, RPG, exploration, humor and fidelity at the same time, TT Games put a real effort in this new adaptation with the LEGO Twist. A surprisingly faithful adaptation of an unforgettable fantasy journey: you're likely to fall in love in the time it takes to get there and back again. The best yet in the series, but with a modest play time and simple gameplay it's hard to recommend as a purchase for adults. The formula is simply starting to wear a bit thin. For fans of the films, it's a quality product that does the license justice and likely represents one of the final pop culture spin-offs before the trilogy is finally laid to rest. Лучшая LEGO-игра TT Games на сегодняшний день. Кажется, разработчики нащупали близкую к идеальной формулу обращения с лицензиями. Очень интересно посмотреть, что будет дальше. Even with the occasional silliness, Lego Lord of the Rings perfectly captures both the great action of the franchise and the majesty of the world Tolkien created. It's the first Lego game since 2005's Lego Star Wars that I can recommend with very few caveats. Система весьма продвинутая: сперва надо найти необходимый чертеж, доступный только при повторном прохождении сюжетных заданий, накопить достаточно блоков и LEGO-пупырышек, и только тогда создать нужную для квеста вещь. Зато в награду получите один из «красных кирпичиков», по сути — узаконенных чит-кодов, помогающих найти еще больше секретов. И в этом — вся LEGO Lord of the Rings: после окончания кампании тут все только начинается. Lego Lord of the Rings is a tremendous experience for players of all ages, and a safe Christmas hit for fans of the film trilogy. There's enough new ideas, and the same fabulous co-op features and option to explore previously-visited areas of secrets, which are mainstays of previous Lego games. In other words: we're quite ready for another fine (and square) adventure. Если раньше в лего-играх можно было наслаждаться абсурдностью ситуаций и глупыми ужимками персонажей – никуда они не делись и в LEGO The Lord of the Rings – то теперь все происходящее напоминает игру в привычном смысле. И «Властелина Колец» во всем его размахе и величии, что для проекта такого рода высший комплимент. Traveller’s Tales have stuck to their formula, but luckily the source material is so iconic, and the tribute so thorough, it barely matters. LEGO Lord of the Rings всюду чувствуется несвойственная Traveller’s Tales серьезность. Дело даже не в том, что с помощью найденных чертежей можно натурально крафтить новые лопатки и луки, а местами игра напоминает игрушечный Скайрим. Lego The Lord of the Rings: The Video Game is fundamentally a good game based on a great licence, but it's let down by the squiffy port to Vita. It lacks some of the unique charm that the series is known for, and the gameplay, while fun at times, is beginning to lose its luster. Lego TLOTR is, despite its many flaws, still broadly enjoyable. It has charm, it has its moments and the series holds an undeniable attraction for kids both actual and inner. It's a Lego game, in other words. But it's bloated, too, full of half-formed, shoddily executed ideas and frustrating glitches. For the Vita, this is inexcusable. Dreary, washed out colors make the LEGO elements indistinguishable from the non-LEGO ones, which robs the former of its trademark charm, and the latter of its magical ambiance. При всех хронических болячках сериала (своенравная камера, необъяснимые приступы тупости у напарников) и странностях в повествовательной части разработчики попали в яблочко с выбором темы. Всё-таки «Властелин колец» в игрушечном исполнении сохранил главные черты оригинала. Не без шероховатостей, но от LEGO-проектов уже давно не ждут идеала.